Darth Vader is a badass. We’ve always known this. It’s written into our code as science fiction-loving human beings. But how often do we actually get to see him be a badass? His lightsaber duel with Obi-Wan is a couple of old dudes knocking some sticks together. He can’t stop Luke Skywalker from blowing up the Death Star. He leaves it up to a bounty hunter to find the Millennium Falcon. And mostly he’s either whining over his wife or whining over his son. The dude is the most menacing villain in the history of cinema, but the movies leave a lot to be desired. Fortunately, that’s where the comics come in! 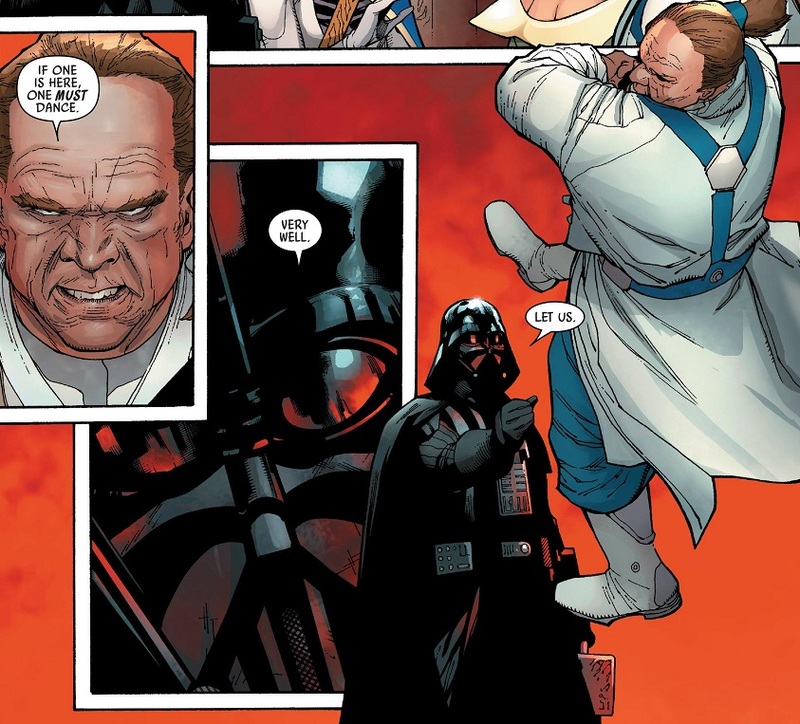 Ever since Marvel took over writing Star Wars comics, they have been doing a real bang up job. 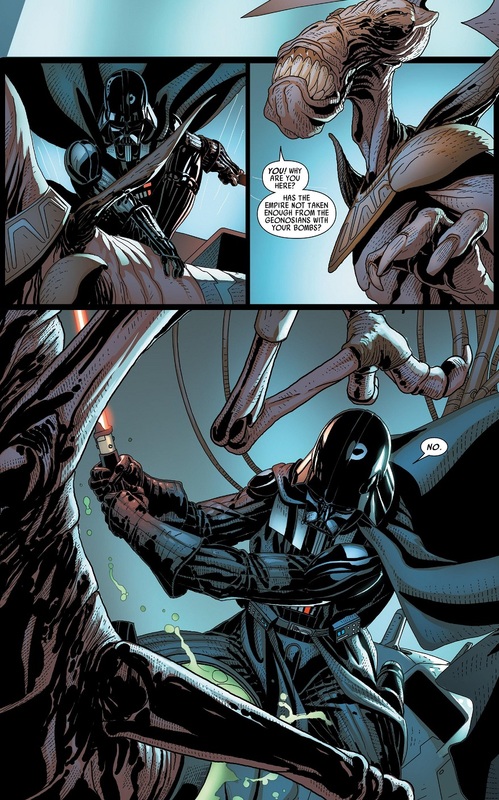 Writer Kireon Gillen and artist Salvador Larocca were on the Darth Vader comic, which lasted 25 regular issues and a couple bonus issues. The series came to an end last week in grand fashion. This was one hell of a comic. 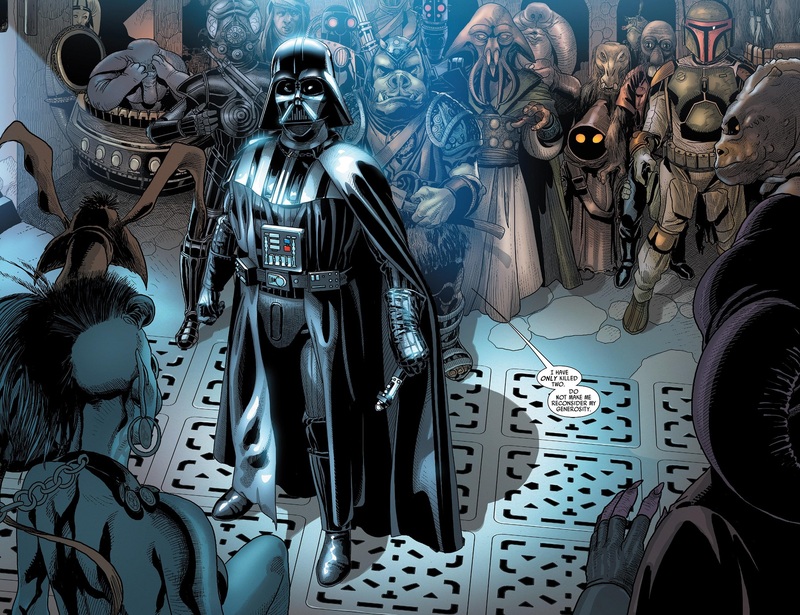 The Darth Vader series presented the Dark Lord of the Sith in ways we’ve never been before. This was a Vader unrestrained by a special effects budget or story choices that focus on Luke. This was a Darth Vader powerful in the Dark Side and loyal to the Empire. This was Darth Vader as a force of nature head of state who commands fear and respect wherever he goes! 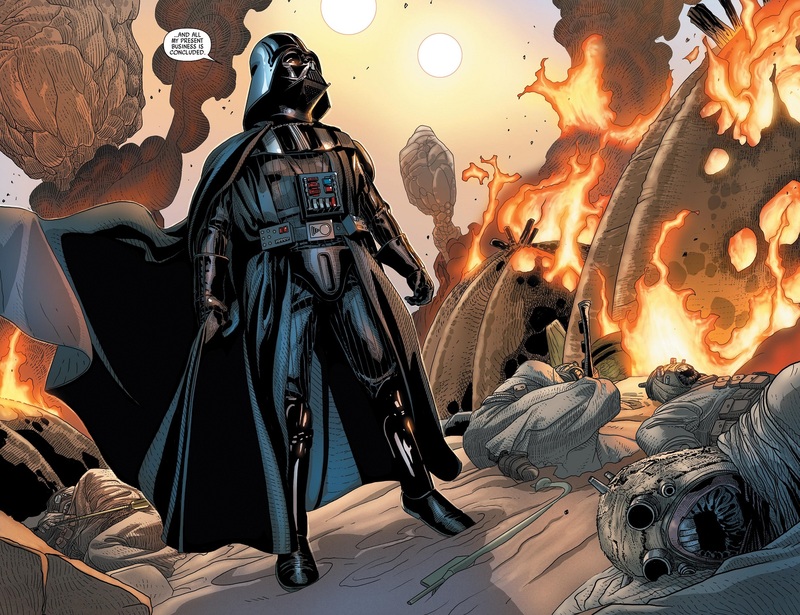 And to celebrate this awesome series, I went back through my issues and picked out six of the coolest moments from Marvel’s Darth Vader comics! 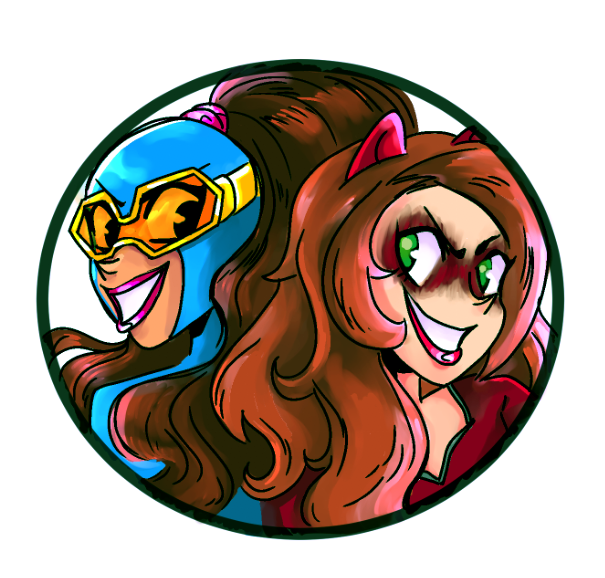 Hopefully this will convince you to pick up the series if you haven’t already. Join me after the jump! 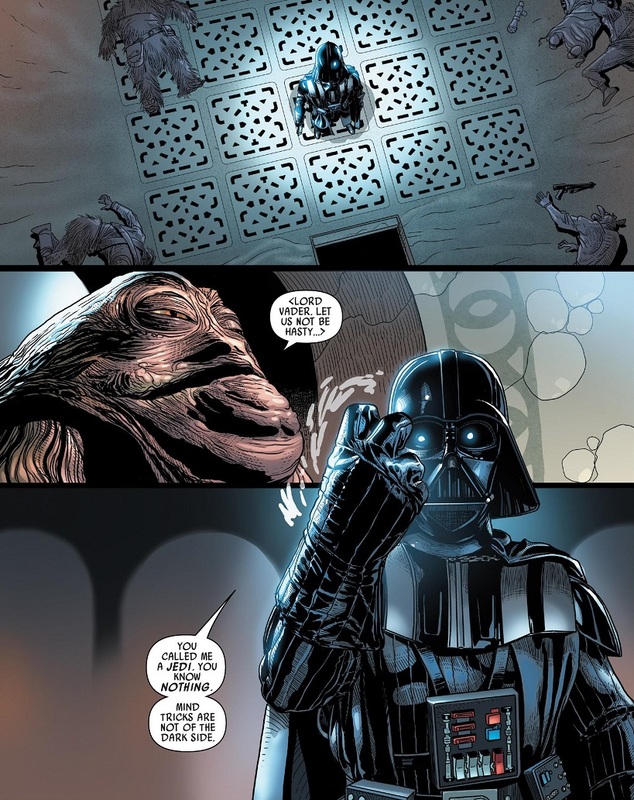 The very first issue of the Darth Vader series kicks things off with style, by putting Vader against another famous Star Wars bad guy: Jabba the Hutt! An obvious callback to the time Luke Skywalker went to visit Jabba in Return of the Jedi. But unlike Luke, Vader doesn’t let himself get pushed around. 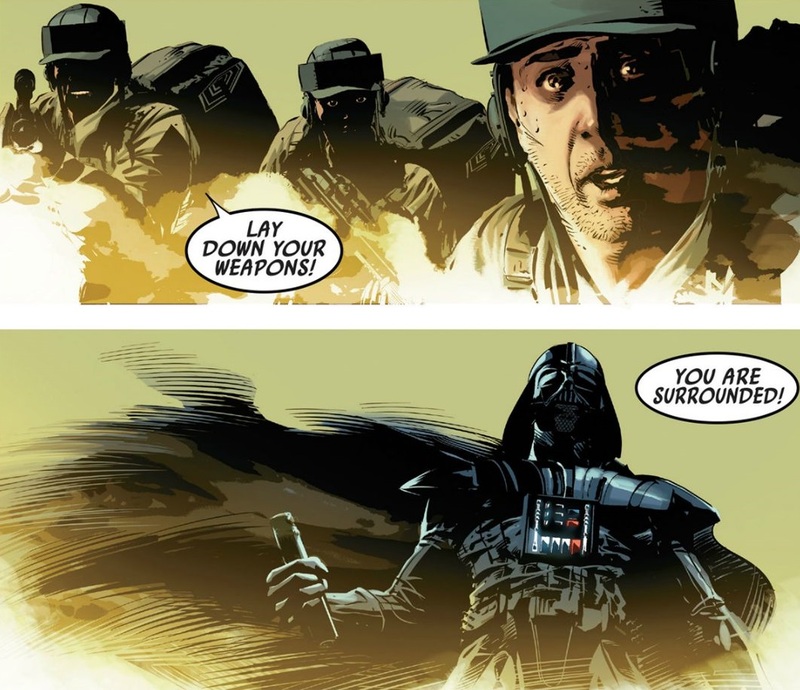 Vader cleans house. Jabba knows nothing of the Dark Side! The purpose of the meeting is that Darth Vader is on Tatooine for Empire business, but he also has some personal business of his own. So on the day before he’s scheduled to meet with Jabba on official business, he shows up at Jabba’s Palace and makes things personal. Jabba doesn’t scare easily, so Vader make sure to put more than enough fear into the big slug to get what he wants — which turns out to be a team-up with Boba Fett, so awesome. This scene is a personal favorite of mine, coming early in the series. I knew we would be in for a good series when I saw the badassness of this scene, both in the action and in the writing. 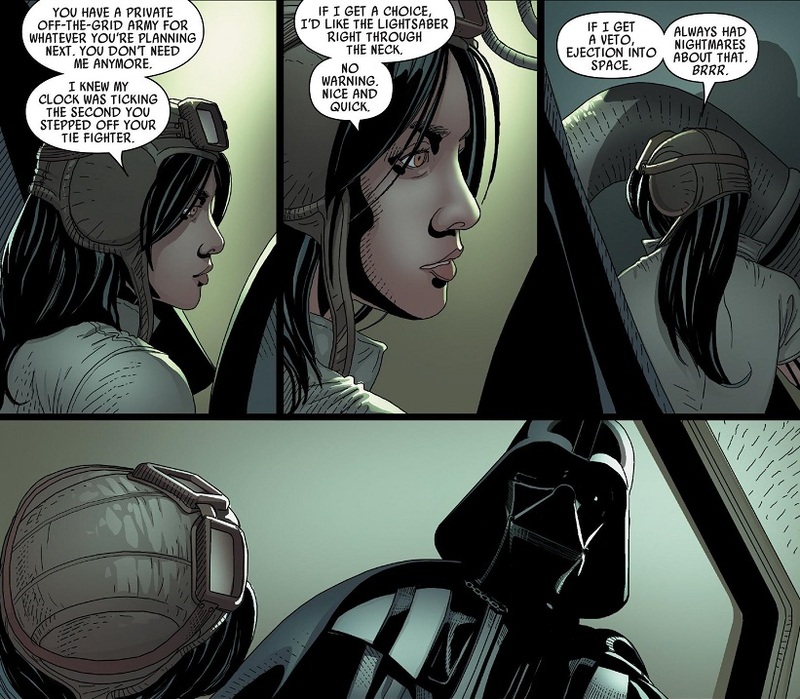 Let me set the scene for you: Darth Vader wants a secret army to conduct his own evil plans, so he recruited a robot specialist, Doctor Aphra, to be his sidekick. She tracks down one of the last surviving hive queens from Geonosis, the planet from Attack of the Clones. Remember when the Geonosians forced Vader and his wife into gladiatorial combat? He definitely remembers, and he’s pretty pissed off at the whole damn planet. But my favorite bit is the writing. 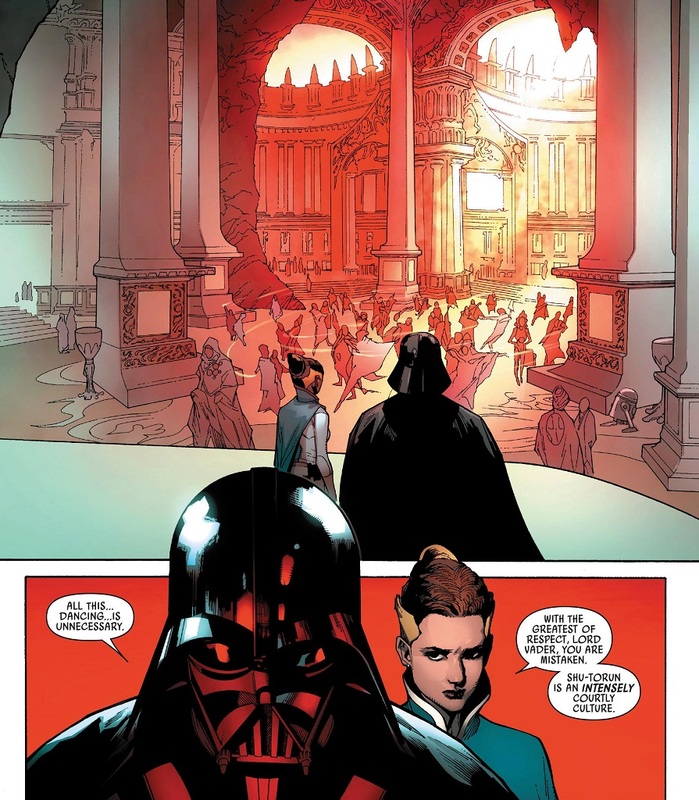 Check out Vader’s ruthless one-word dialogue as he attacks the queen. The man is brutal. 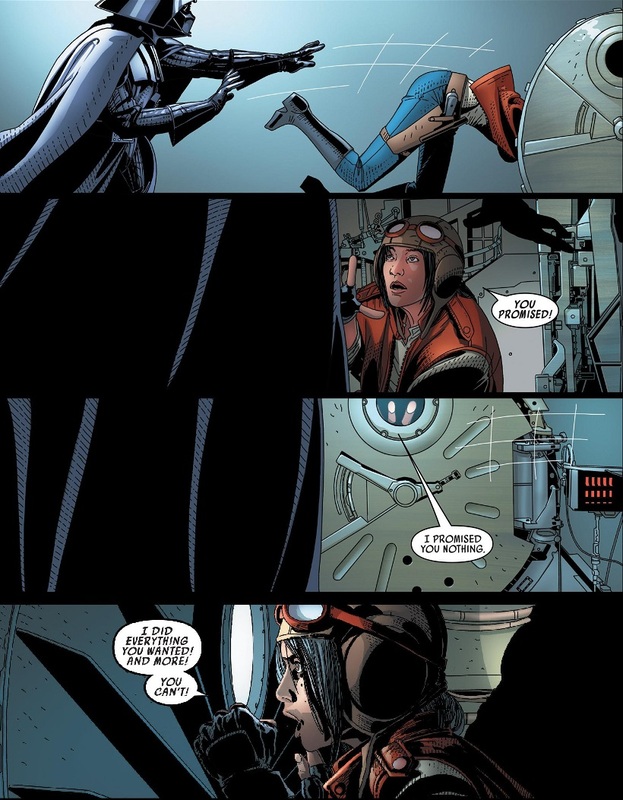 He and Aphra quickly make their escape with even more Force awesomeness. His power is awe-inspiring. Plus he got that army he wanted! This is a really fun moment that, in many ways, gets to the heart of the series. 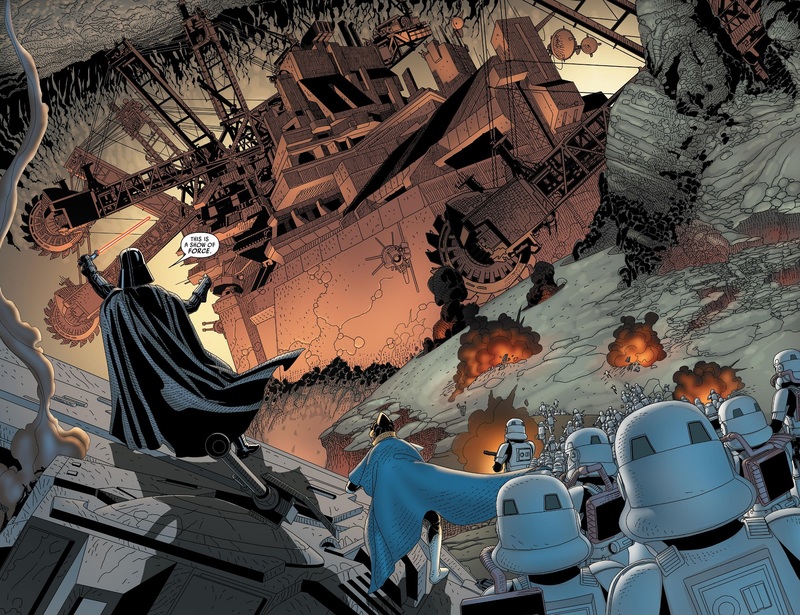 As an emissary of the Empire, Darth Vader has a lot of responsibilities to go along with his rebel-killing. In this story, he is sent to the planet Shu-toren to negotiate resource shipments. 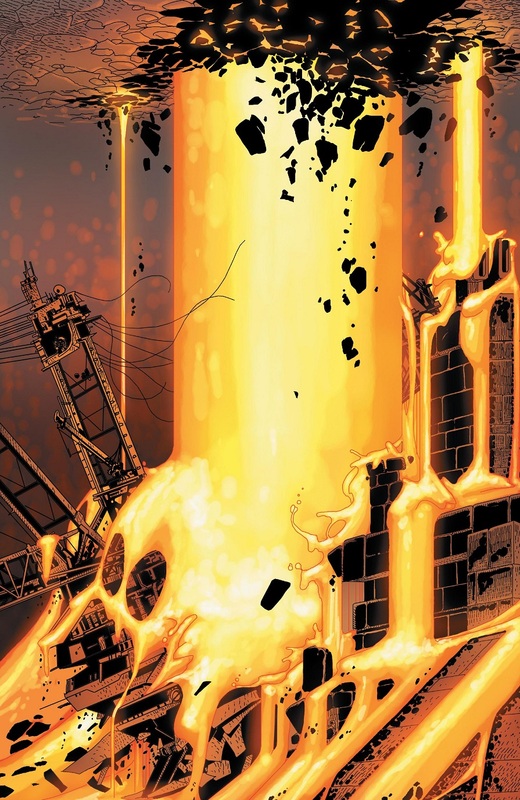 Shu-toren is a big, industrialized mining planet, covered in rock and molten lava, and they have fallen behind on their quotas. 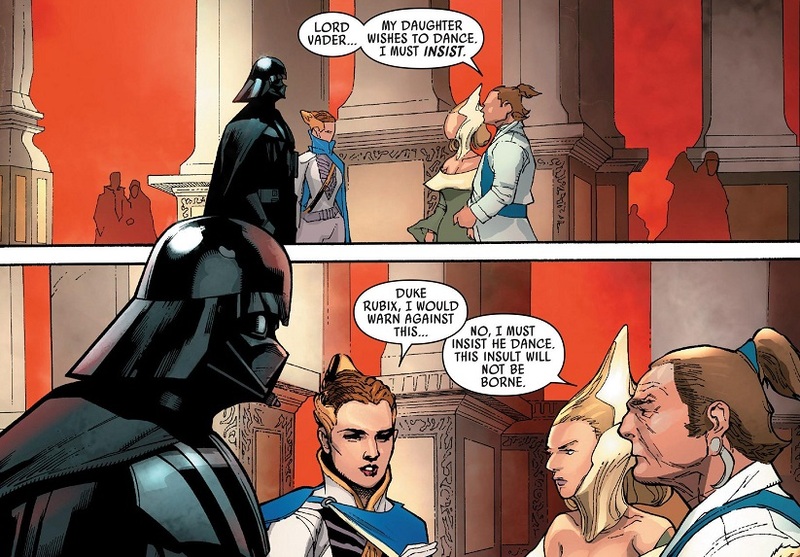 It’s a diplomatic mission, and as such, Vader has to play nice with the Shu-toren royal family. And playing nice involves attending one of their grand balls. As the princess tells him, Shu-toren is “an intensely courtly culture”. If you live on a rock and lava-covered planet, you’re going to need to try and inject some fun into your life, right? Dancing is very important to the people of Shu-toren, and as such, one of the ore-barons demands that Darth Vader dance. I guess the daughter and Vader do share a love of crazy headgear. But the request does not go well for him. And now we all know that Darth Vader does not dance, but he also has a wicked sense of humor. The people of Shu-toren live in these giant ‘delving citadel’ structures, like half-castle, half-drill, as you can see in the picture. And when the ore-barons rebel, they use these delving citadels as war machines. Makes sense. They’re huge, powerful, impenetrable and come equipped with all manner of weaponry. These things are true beasts of war. And Darth Vader knows that a direct assault will never work. So what does he do on this planet covered in molten lava? 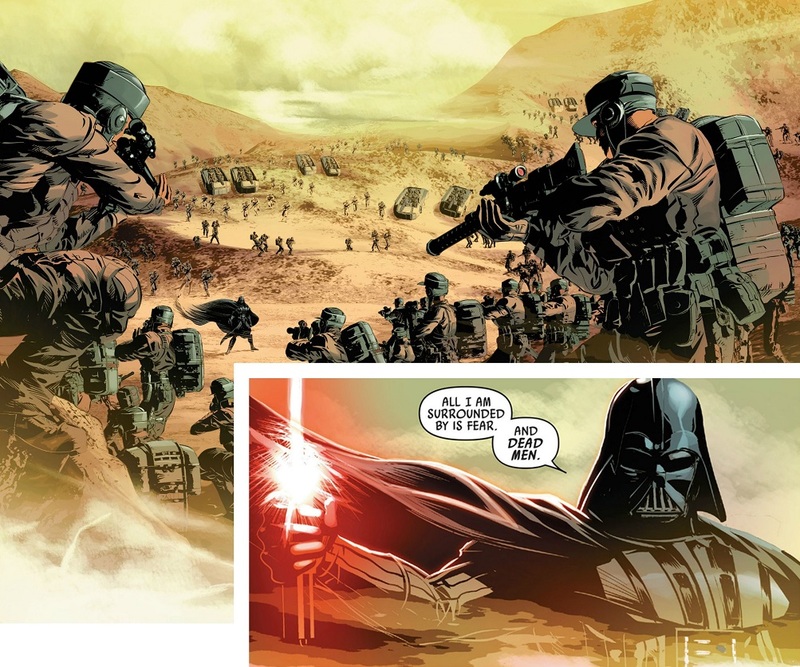 Vader is pretty nonchalant about killing thousands. And it’s safe to assume that he goes on to win the war. The ore-barons didn’t stand a chance after that opening barrage of freakin’ lava. This one is painful. 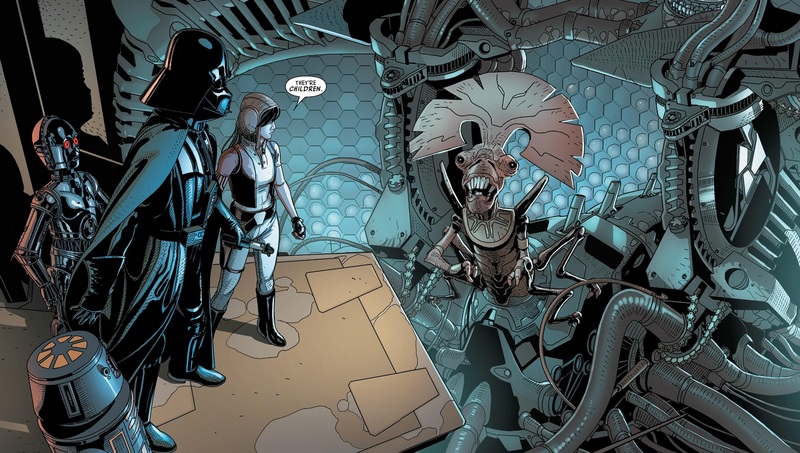 So Vader brought on Doctor Aphra as a sidekick to work as his technical support staff. Even Vader needs some help when he’s got so many evil plates spinning. 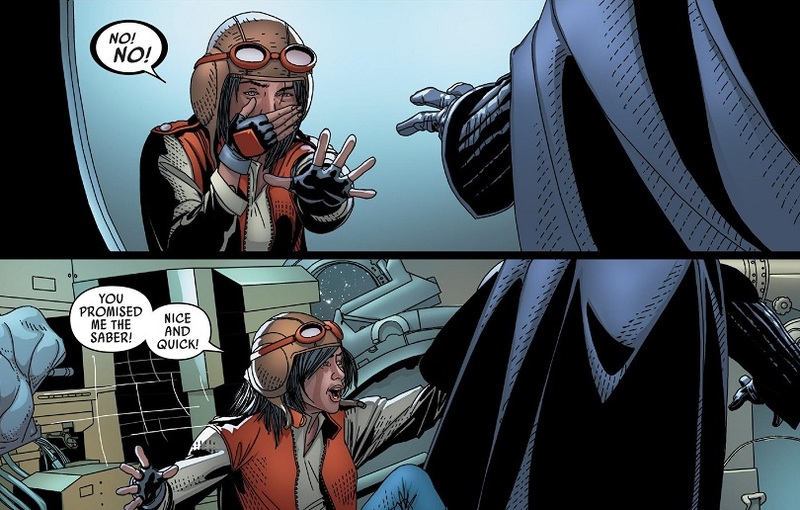 But Aphra is a smart one, and she knows that working for Darth Vader on secret covert stuff means that he’ll probably kill her when he’s done with her. A guy like Vader can’t have witnesses, and he’s not known for being nice to anybody. He signed her death certificate the moment he decided to use her for his work, and she knew it. 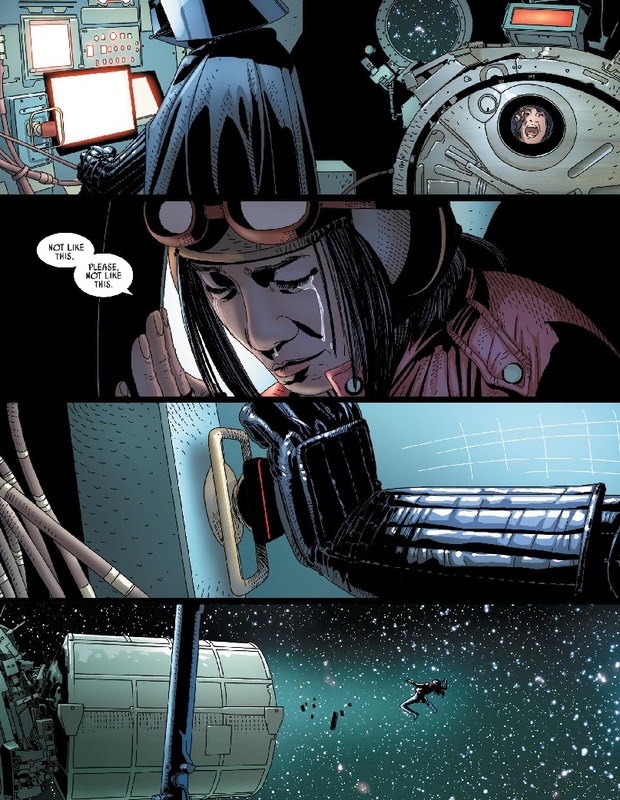 So after their first job together, in issue #4 of the series, Aphra makes some requests about how she wants to go out. Vader says nothing in response. 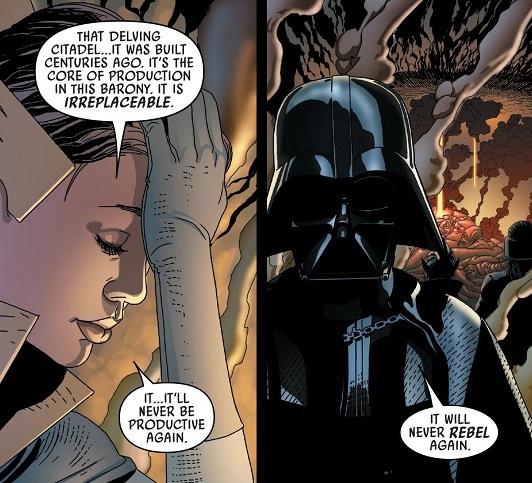 Cut to the final issue of the series, Darth Vader #25, and Vader has finally decided on Aphra’s fate. She betrayed him and tried to rat him out to the Emperor, but Palpatine was quite pleased with Vader’s duplicitous ways. So when the time comes for Darth Vader to dispose of his sidekick? That’s cold, damn cold. That’s also very much Darth Vader. We’re going to get a little off track with the No. 1 pick, because it’s so great that I have to fudge the details a little bit. 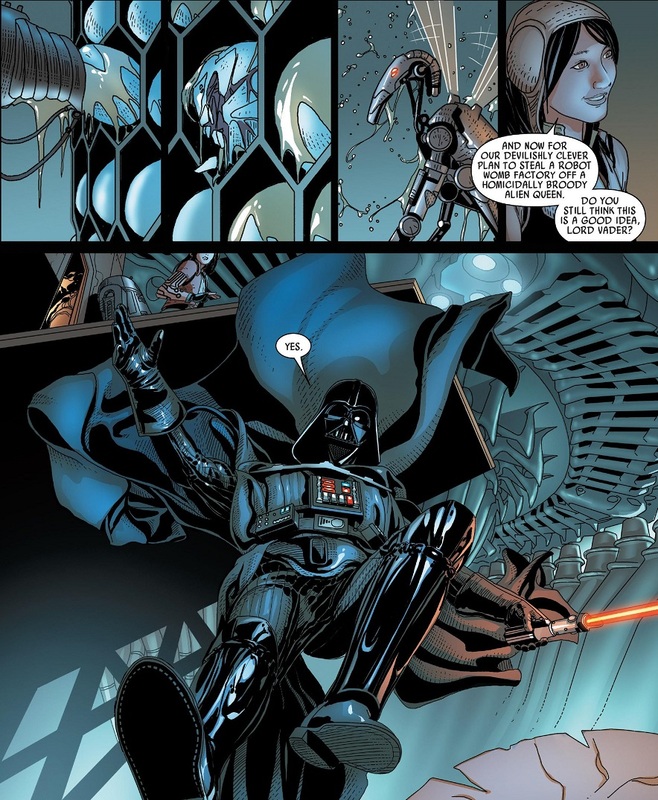 This scene actually comes from Vader Down #1, the issue that kicked off the first major crossover of the Marvel Star Wars comics. And it’s written by Jason Aaron. 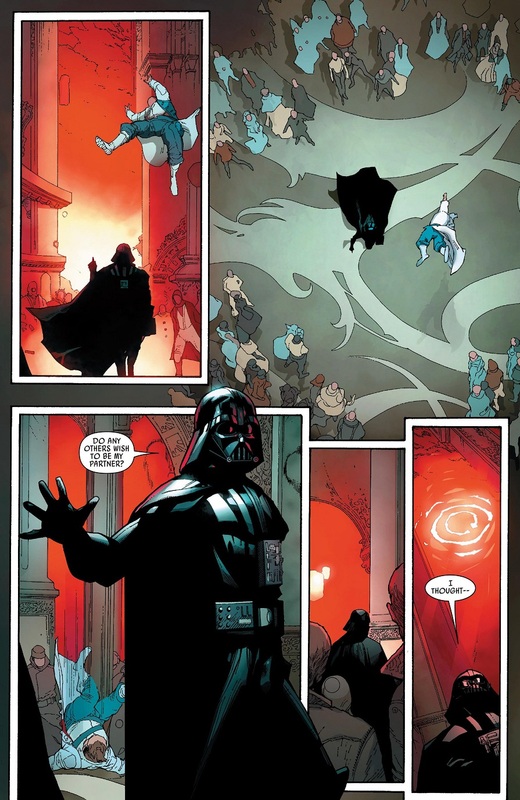 But if any moment has come to define Darth Vader in this new continuity, it has to be this moment. It has to be this single line of dialogue that sends shivers down the spine. …you’re stuck on this planet with him! And it’s all downhill from there for the rebels. Posted on October 19, 2016, in Comics, Lists of Six!, Marvel, Star Wars and tagged Darth Vader. Bookmark the permalink. Leave a comment.